Group B is stacked already looking like a group of death and you can probably add either Serbia or France to it. Looking forward to Argentina vs. Brazil should be a fun atmosphere. Group B is merciless, and than you add the potential of a Croatia, Italy or Greece entering the fray. Good luck coming out of that bracket. The US and Australia may headline the group, but Serbia (almost a lock to get in) and Canada/France (the likely two contesting for the second qualifier) could make things interesting. There's such an imbalance in the draw that I'm not so sure the US benefits by being in the weaker half. When the second round arrives, if the US wins its bracket, they have a minefield to navigate through to get to the GMG. Brazil, Argentina, Lithuania, Spain, Greece or Italy...any of these teams can challenge the US if the conditions are right, and in a one-and-done scenario, anything can happened. Last edited by Federoy; 03-13-2016 at 05:31 AM. Draw is actually very well balanced, Coach K apparently thinks so too. Brazil and Argentina are really not that good right now, both teams have gotten very old, and I'm not aware of some new talent. Spain is far from what they used to be as well, Pau's insane games at Eurobasket are the only reason they've gotten so far, rest of them have looked pretty bad, compared to earlier years at least. Lithuania is strong yes, they might not have talent on par with some other teams, but they are fighters, they play hard and are not afraid of anyone. This is probably the main reason for their consistency over the years, and ability to challenge the USA, when everyone else is scared of them. Greece is a mystery, they can do really good or really bad, as was shown in the past 2 years. Italy similar, on a good shooting day they can beat anyone, but if baskets stop falling in then they're doomed, their defense is terrible. 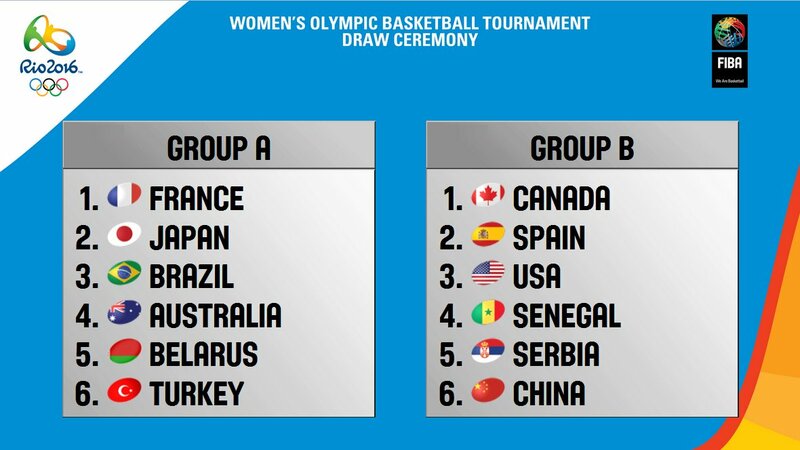 France and Serbia are right now in probably better state than any of the group B teams, and will definitely give USA a challenge equal to Spain and Lithuania, as they're most likely to end up in group A. Group B won't be stronger, but definitely is more balanced, there's no telling who'll advance there and in what position, so I guess you can call it a group of death from that perspective. In group A everyone can presume that Venezuela and China are gonna be at the bottom and USA at the top. Coach K and Jerry have a habit of being pretty humble and it's good they are but you know they are happier to be in A instead of B. Also, is this the same Serbia a weaker Team USA ran over for Gold in 2014 or nah? In all honesty do you really think they care or makes a difference what group they are in? The preliminary play is borderline meaningless for them and it will come down to whether they are tested in knockout play. No, its not the same Serbia, that team only had the goal of making it past groups, no one was hoping even for semis, but I knew they can make it that far. It will be a much stronger team now, especially considering the match up with USA. If that team has a weakness then that would be the front court, and front court is what Serbia was lacking the most for past 2 years. This time it will be a bit different. Also, team USA from 2014 was far from the B team, I really wish people would stop saying that. It had the splash bros, it had Harden, it had Cousins, it had Irving, who has managed to make 6 shots behind the arc in a row in that final game, and it had Davis and Faried who were killing everyone in the paint. How exactly do you top that? Simply stacking more bigger names in a team doesn't make it better, and can in fact make it worse. I could elaborate on this, but it would probably derail the thread, so lets leave it at that, and maybe repeat the fact that Serbia did win silver at the previous world cup, and France has won bronze. That's better than anyone from group B, if you wanna follow that kind of logic. So, as was said in the post before mine, I also doubt that coach K cares much about what group they're in, that team aims for the gold and is supposed to take every game seriously and win them all. He also probably scouts the teams they're supposed to play, rather than look at 8 year old FIBA world rankings. Its a list that puts Italy at 35th spot, behind teams like Panama, Great Britain, Uruguay, etc. So many "experts" see big names and make wrong presumptions. I've actually read an article earlier today, mentioning Scola and Nocioni, saying they were linchpins of a team which has beaten the USA in 2004, and will play again in Rio, as if this means Argentina will be strong again with the same key players from 12 years ago. I don't understand this logic, I really don't. I agree with you about the 2014 USA team not being a "B" team. I was one of the few in this forum that said they were loaded from the beginning. People here were even saying that the 2010 team was better. Now that was a B team. The 2014 team was probably one of the best shooting teams Coach k ever had and was superior to the 2010 Durant reliant team. Only the 1994 team was better in the history of World Championship teams. I never said they were the B team but it certainly wasn't the best possible team. I don't really buy into that silly separation. You go with who you have available. That 2010 team wasn't a B team to me because they got gold which the 2006 team didn't. Also those players getting better doesn't retroactively make that team better. Group B is very difficult and there will be no easy match, in contrast to group A, where now almost everything is clear. but if one of them ends up in our group its safe to say we're in group of death. FIBA World Championship : Bronze 2010. FIBA European Championship : Gold 1937-1939-2003. Silver 1995-2013-2015. Bronze 2007. If Serbia and France will enter the group A since it will not leave less predictable. I think Canada will also not be lighter challenger.